Albums or singles with adult lyrics or artwork are allowed in iTunes and other stores, but they must be marked "Explicit." It is up to you to mark your tracks as "Explicit". If a digital store finds out your release has explicit lyrics and you didn't mark it, both TuneCore and the stores reserves the right to remove it at any time, or it may be rejected right from the beginning. Tracks should ONLY be marked as "Clean" if there is another version of the same track and it is marked as "Explicit". Clean versions of explicit tracks must be flagged as "Clean" to prevent customers from accidentally purchasing an edited version. Tracks must only be flagged "Clean" if there is a corresponding explicit version of the track. In order for us to mark a track as "Clean" you need to contact us here . 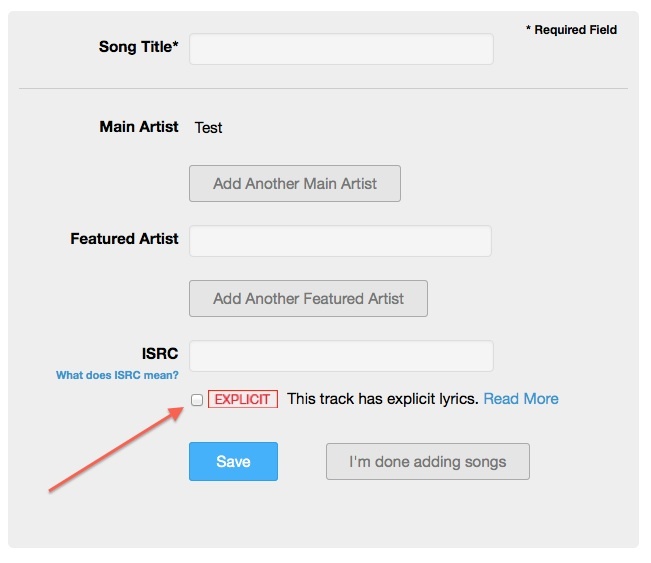 IMPORTANT : Although TuneCore lets you mark individual songs as explicit, even if one song on an album is marked as explicit, the ENTIRE ALBUM will be marked explicit. There is no way to restrict it to a select few songs. It works just like the sticker affixed to the covers of CDs: it indicates the CD has explicit content, not just any given song. Please be aware of this when you make your choice.